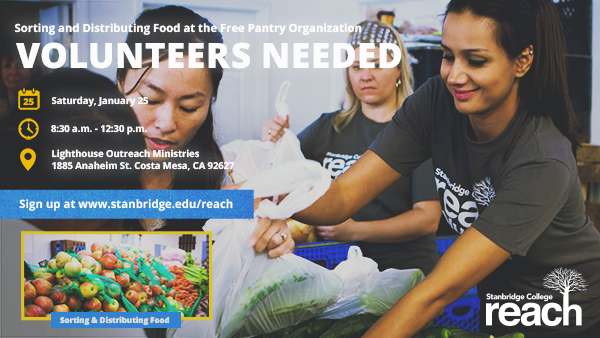 Stanbridge College REACH – Beyond the Classroom invites you to volunteer to help the homeless on January 25th in Costa Mesa. According to the County of Orange, an individual earning minimum wage has to work 124 hours a week just to afford a one-bedroom apartment in Orange County. This is why 1 in 6 people live in poverty and are homeless and hungry. Help sort and distribute free groceries and household items to those in need at the Free Pantry Organization in Costa Mesa. The Free Pantry Organization is also in need of donations of jars of peanut butter and sunscreen to offer to the needy. If you are able to donate, you may drop donations off to Samantha Mellinger in room 202.